Intechnica has developed a proprietary Performance Assurance Framework designed to meet the requirements of businesses seeking to provide excellent performance management of their applications. This framework is based on 20 years of experience across multiple industry sectors and across the full application lifecycle encompassing inception, development, QA and operations. One of the most important elements of this framework is the Performance Maturity Matrix, this gives a easily understood assessment of the current state of performance within an organisation and can be extracted into a single Performance Maturity Score. 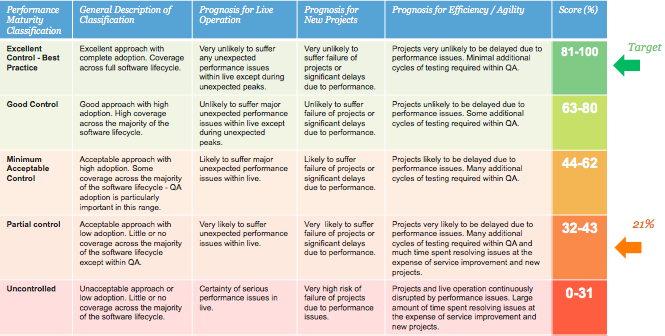 An overview of the Performance Maturity Matrix is shown below. The Matrix allows businesses to assess not only their current state but also their target state by assessing the importance of good performance within their organisation. Off the back of understanding their current performance position and target position, a performance improvement roadmap can be created, illustrating the steps that should be taken to advance the company from current state to target state. For each step on the improvement roadmap, the Performance Maturity Score will increase, showing constant advancement towards the target state. The Performance Maturity Matrix and related Performance Maturity Score are a simple way for businesses to understand and control their performance state and to put in place a roadmap to good performance.